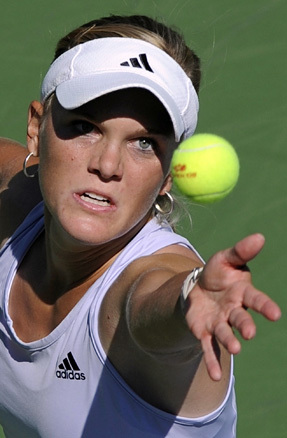 If we’re getting to the end of the first round of a major, then it must be time to write the whatever-happened-to-Miracle-Melanie Oudin story. It’s now or never, because this is when she leaves. This time, she lost in the first round of the French Open Monday to defending champ Francesca Schiavone. It was 6-2, 6-0. Oudin, who’s 19, was Miracle Melanie for a week and a half at the 2009 U.S. Open, when she kept beating seeded Russian players and reached the quarterfinals. In some ways, that run might have messed her up, or maybe she just was playing way over her head. Whatever the reason, here’s a little cold truth: Oudin is a one-hit wonder. You can cheer for her, hope for her, wait for her. It’s not going to change anything. Oudin is not a top player. She’s a journeyman ranked No. 88 in the world. She has time to get better, but it’s hard to see her ever as a top 25 player. Oudin never got a grip around her run through the Open. It’s funny because during that Open, she was playing so freely, smashing running forehands down the line. She looked like the real deal and was winning mostly on mental fortitude. Her opponents simply became too jittery under her relentlessness. By the time she reached the quarterfinals, she was the It Girl of American tennis. John McEnroe was predicting that she would win. And then she nearly panicked under all the attention as she lost to Caroline Wozniacki 6-2, 6-2 in the quarters.